Basel, the city in the border triangle and the largest exhibition and trade fair center in Switzerland has its very special geographical location to thank for its unique flair. Here life is pulsating and the art scene enjoys a worldwide reputation, which is also reflected in the city's museums and galleries. A shopping haven with Mediterranean flair that can be enjoyed in the numerous street side cafes, but especially an economic hub, which attracts exhibition and congress visitors from around the globe. 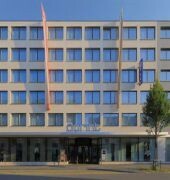 And the 3-star conference hotel Dorint "An der Messe" is the ideal starting point for both private and business trips to the city of Basel. The service oriented team ensures that all our guests at the Dorint Hotel feel completely at home.